Taking advantage of our house guests we took the opportunity to have help moving the fridge freezer from the study on the top floor down to the conservatory. Mostly in preparation for the study to be decorated and partly so we'll have a functioning fridge freezer on the ground floor while the kitchen is replaced. It's also this fridge freezer's final resting place before heading to the big fridge freezer in the sky in the not too distant future. It's done well though, we had it when we moved in ten years ago and it wasn't new then! Of course moving it down wasn't that simple. 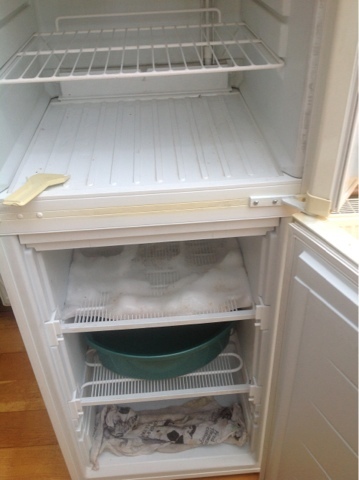 It needed to be emptied - we hadn't done so well on the "eat the freezer" challenge. To be fair, we haven't done so badly but it's not helped when the local butchers has so much scrummy produce that I feel the need to buy! I am justifying this by mostly buying things we can barbecue!